Really looking forward to this. I was wondering if there was anyway to create a touhou style bullet hell game? You can make a bullet hell game with the SHMUP Creator. There's way to create complex bullet patterns and to use scoring systems. As for touhou, shame on me, but I never tried any game of the serie. Is there specific features you'll be interested in, in order to make such a game ? I think having easy dialog implement before bosses would be cool. There are lots of really wonderful touhou style spell cards that would be really nice features. In terms of bullet hell games, what patterns are you familiar with? I could make a list of things that I'd like to see. Touhou Danmakufu has a good variety of bullet boss style patterns, length and bullet projection range. We’ve been busy these last weeks, but not necessarily on the SHMUP Creator. We worked again for a big company on a cool project. It’s always frustrating because we can’t make progress on the SHMUP CREATOR while we work for someone else, but to be honest our contract was really interesting and we learnt a lot. I wasn’t happy with the way users had to import 3D assets in the editor: you had to use an exporter to save a file from your 3D modeler in the Ogre3D format (.mesh). Now, you can copy an .FBX in the asset directory of your game and it will appears at once in the Gamebox. You can immediately drag and drop it in the level and start to play. It’s quite simple and easy! You can then modify any textures, meshes or sprites, and when you go back to the editor all the objects are updated! We are testing every features of the game one by one. Then, there are features which are working well but which are too difficult to grasp for the user. Not because of the way they work, but because of the GUI and the way we are presenting the functionalities. We need to rework them. i just just seen your post about redoing the R-Type Leo level. Looks realy nice so far. I´m very interested about your progress. Not enough time to work on this as much as I want these days, but I'm slowly making progress. I'll post some r-type leo videos this week-end, and next week I'll write an update on my (too slow) progress. I needed to test the 2D features of the SHMUP Creator but unfortunately didn't have the time to create assets right now. So, I choose to re-create parts of the first level of R-Type leo using sprites I ripped. A good tool to make progress, debug and polish. Of course, using a drag-and-drop tool, you can't do everything: the rotating orbs from the game are absent in my demo. 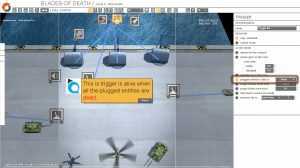 I plan to allow users to use objects for weapons, but not in the upcoming release. Next week, I promise I'll do a small update on the dev progress! Last edited by suny on Tue Jan 10, 2017 5:39 pm, edited 1 time in total. Looking good as always, suny! Will it be possible to implement some GigaWing like shield to reflect bullets? I play a lot of GigaWing at the moment and thought about making a game with similar mechanics. suny (or anyone else), were can I read up how to rip sprites out of roms? There is a kind of bugged program called Artmoney. Some people used to use it for Mugen works, ripping fighting game characters. You could also use debug options on the emulator to disable the tiles that you dont want to, and then run a program like Animget, which can take screenshots each 10 miliseconds. Are there any news on an alpha/beta version? No, it's not possible for now. I'll put this on my v2 to do list. Not yet. I can't give you a date, because I'm not working full-time on the SHMUP Creator right now. But I have only 2 features to complete before the pre-alpha (the 3D snap and some kind of in-game tutorials). Then, I really need to write some docs before going alpha, and I can't say when I'll have time. Hey suny, how is it going? I didn't had a lot of time recently, but I'm still working, slowly, on the SHMUP Creator. It's feature complete now, but I have some urgent debugging to do. I hope to work on it full time starting next week, and I'll give you some progress report very soon. I'll talk about all this in a new post soon. I added Snap 3D, a tool which allow users to snap any 3D objects with other objects. It can speed up the level creation of a game and is easy to use. Always good to see updates from this project. A technical post today. I'm going to give you more information on the state of the project very soon. My bullets code was terrible: I wrote it a long time ago without any optimizations and forethought. It worked and it was enough for me. Then I had second thoughts, some nightmares and bad nights, and I finally decided to write a real bullet manager and optimize the guy. I knew that creating and destructing a lot of objects every frame was bad, so I created a pool of bullet objects at the SHMUP Creator runtime. It worked. What was bad was the way to manage the active and free bullets in an efficient way. I was iterating on all the bullets to find a free one before spawning it and to update the alive bullets and so on. Not too bad with the CPU power of 2017, but not very efficient with 6000 bullets. So I wrote a bullet manager which keep tabs on all this. I still create a pool of bullet objects but also 2 lists of bullets IDs: one of active bullets and one of free bullets. Those IDs are references of the pool’s bullets. If I want to spawn a new bullet, I can use the last free bullets ID and set the bullet from the pool sharing this ID to “active”. I then remove this ID from the free bullets list and add it to the active bullets ID list. This active bullets list allow me to only update the active bullets and also to maintain an ordered bullets list, which I need for rendering (more details in the next section). When a bullet is dead, I set its state to “DEAD” and I erase his ID from the alive bullets vector (I know it’s not the most efficient thing in the world, but…) and add it to the free bullets vector. The most terrible thing I was doing was to draw individually each bullet. It was working on my laptop, so what the heck? But I really felt bad about it, and with a lot of bullets, I began to see some performance drop. On top of this, ordering the rendering of thousands of objects was not easy with Ogre and was slowing down the game a lot. So, I wrote my own bullet renderer. For each bullet type I create a polygons list using all the current bullets positions and orientations and draw it with its own material. Thanks to the active bullets list I’m able to draw each bullets in the right order. At the end, I have only one draw call for each bullet type, instead of 3000 draw calls for 3000 bullets. Much better! At the end, the bullet manager is not perfect and could be more optimized but I’m pretty happy with it. Maybe one day I’ll go back to it and make it better. TLB for Trigonometry Wars 5 leaked?? Very excited for you to finish the kit. Keep the updates coming. Last monthly update was in February… Ouch. So many things happened during the last 10 months… Time flies. 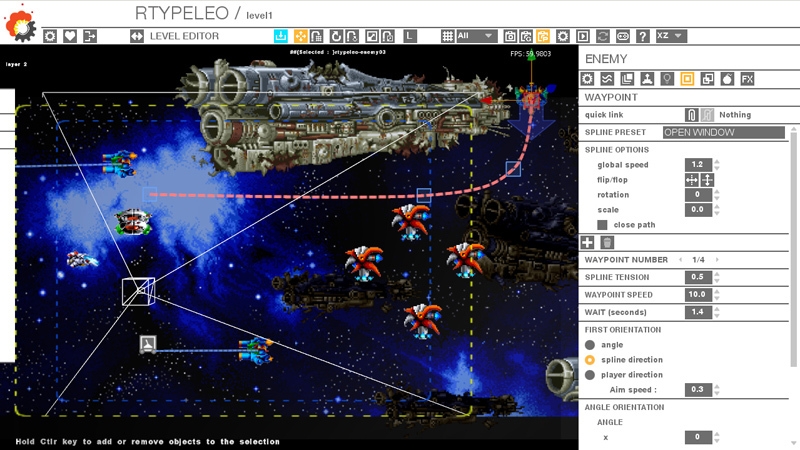 The SHMUP Creator is feature complete!
. I wrote about the 3D snap in the last update: it is complete and it works. Yeah!
. the tool is translation ready. We plan to release it in English and French first.
. I’m working on the documentation. It’s taking shape but it takes a long time.
. we are still working on the UI: the menu editor and the HUD editor are still a mess and need a lot of work.
. I’m still unhappy with some parts of the tool: the weapon system is too complex and need some work. We can’t release a beta until we can have time to address that.
. we need to do more marketing. Like not posting an update every 10 months (…). So yeah, it’s going well. I can feel some external forces luring me away from the SHMUP Creator and so I’m dedicated to work harder right now, when I still have some free time. The beta version of the SHMUP Creator is coming, I can feel it! Good to see the project still going! I don't think I have what it takes to create a whole game when you release, but I may try to work on some artworks and sounds. Looking foward! Right now, the engine in the SHMUP Creator is a black box, it's not a stand-alone engine. 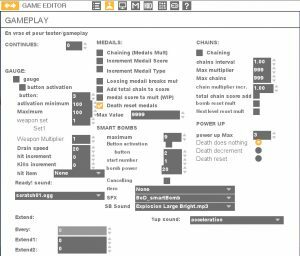 You have to use the tool to use it, there is no way to code or plug it to another engine, and I don't plan to do that, because it's the inverse of the idea of the tool: to allow people without coding experience to make games. That being said, if there were a market for a "pro version" of this tool, I would love to allow people to use Lua or other scripting method to add properties to the bullets or the enemies. How do you think scripting could be used in the SHMUP Creator, in a minimal way? What language are you developing this in? C++ and a bunch of libraries: mainly Ogre3D for visuals.